Making of "It's a dangerous business, walking out of one's front door"
I've always wanted to make a photo that would somehow represent a place that doesn't exist, by combining different images I've taken over time. Finally, I got a chance to really look through the archive of pictures I have on my hard drive, and put something together for my dad's birthday (I was too excited to post it online, but hopefully he won't see it until I mount it and give it to him :P). 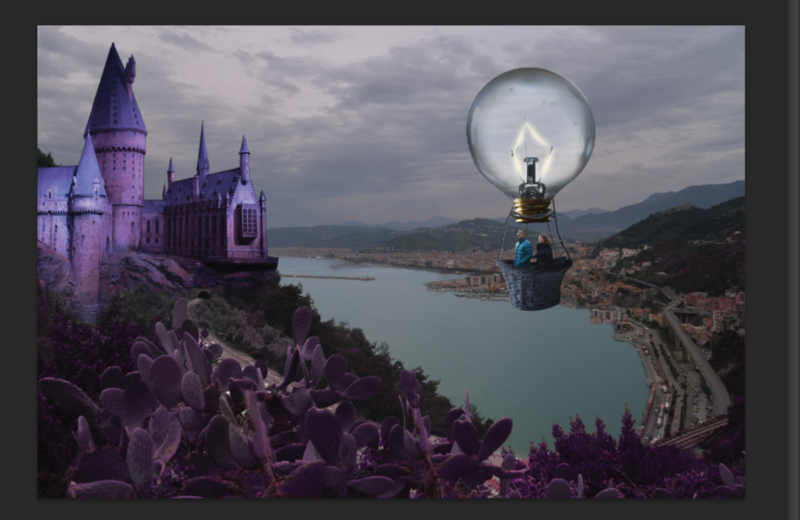 Originally the idea was put the hot air balloon in an urban landscape such as New York, but I soon realized that the Amalfi coast looks much better and more *magical* as the backdrop. The castle picture was taken during the Harry Potter tour in London (it's the actual Hogwarts model they use throughout their films! ), and the basket of the hot air balloon was the basket I used in one of my newborn photo sessions. This is probably the most complex image I've created, because of so many things getting cut out, and playing on lighting and colour tones, so I really wanted to share the process from start to finish :) Thanks for reading! Ps- the title "It's a dangerous business, walking out of one's front door" was taken from a Tolkien book, one of my dad's favourite writers.